Perthshires Capital, 'The Fair City' of Perth, is glowing with Scottish history and heritage. Home to Scone Palace (the crowing place of Scottish Kings), St. John's Kirk, Huntingtower Castle and numerous parks and gardens - namely the North Inch and South Inch - Perth is one of the most beautiful cities in all of Scotland. Tourists flock to Perth each season for shopping, horse races, cultural highlights and theatre performances. The Town centre is full of guest houses and B & B's while mainstream hotel chains offer great value breaks in Perth - New County Hotel, Ramada Perth and Express By Holiday Inn Perth all offer special rates according to the season while hotels like Queens Hotel, Huntingtower Hotel and Alexander Residence are also popular choices for luxury hotel accommodation in Perth. The Heidl Guest house is a long established, 8 bedroom guesthouse situated in York Place close to the centre of Perth. The bus and railway stations are only a short walk or taxi ride away. York Place is part of Glasgow Road, one of the main routes into the city from the A9 and M90 motorways. A warm welcome, comfortable accommodation and a hearty breakfast await you at The Heidl. There is limited free parking (room for 4 cars if carefully parked) and ample public car parks close by. Just 5 minutes walk takes you right into the centre, making further driving unnecessary. All our rooms are non-smoking and have complementary tray, hairdryer and colour TV. Free WI-FI. We cater for vegetarian and vegan diets. Iron and ironing board on request. Children welcome.Travel cot and highchair available. Eating out in Perth is a great experience. A wide variety of tastes are catered for. If you are looking for a top quality, award winning restaurant to celebrate that special occasion or like to sample a variety of international cuisine Perth has a great choice of each, most within easy walking distance of The Heidl. Also in the town centre there are a great variety of bars, many offering top quality food. Many people come to Scotland to trace their ancestral roots and Perth is one of the top locations, holding records unlocking the past of many families. The A K Bell library, also in York Place, and Register House in the High Street are centres of excellence with efficient, knowledgeable staff able to get amazing results. Norman & Christian Macdonald welcome you to Bronton Cottage... Bronton Cottage is a comfortable high-amenity B&B, which is ideal as a base for: Touring, Golfing, Angling and as a stop-over en route to the glories of the highlands of Scotland. We have a triple bedroom with private bathroom, a double bedroom with private double-shower room and a twin room with en suite shower room. Each room has TV, hair-dryer, and tea & coffee. Two rooms have French doors to the verandah and garden. We have wireless broadband and offer free landline calls within the EU. French spoken. There are board-games and a library of books, videos and DVDs. Facilities for ambulant disabled. There is plentiful off-road parking. No smoking within the house. Regrettably, no pets. The village has four good restaurants, bar-meals, and two takeaways. We source our food from the Brig Farmers' Produce Shop at the far end of the village. Perth Railway Station - Train: Perth Railway Station, Leonard St, Perth PH2 8RT, UK, WalkWalk, About 2 min , 440 ft, Perth, Bus56towards Halbeath, 22 min (22 stops) · Platform 2 · Stop ID: 73726474, at Balmanno Park, WalkWalk, About 2 min , 0.1 miles, Bronton Cottage, Edinburgh Rd, Perth, Bridge of Earn PH2 9PP, United Kingdom. Sandy and Ann Guthrie always have a welcome awaiting guests to Newmill Farm be they staying in the House or Self catered Cottage. This 300 acre mixed arable farm is situated on the A9 six miles north of Perth. Accommodation in the B&B comprises twin en suite room, double en suite rooms & family room with private bathroom. The farmhouse is centrally heated with a traditional coal fire in the lounge. Every endeavour is made to ensure the guests are comfortable however long or short their stay. Situated in an area known as "The Gateway to the Highlands" the farm is ideally places for those seeking some of the best unspoilt scenery in Western Europe. Additional accommodation is available in the modern cottage next to the farmhouse. This cottage is independent of the B&B and offers the opportunity for self catering provision. Perthshire is located in the centre of Scotland and offering a wide variety of scenery, history, culture and sport. While staying at Newmill Farm on the A9 road, nowhere in Perthshire is that distant. You can experience the grandeur of the Highland scenery in the north, the historic glens in the west, the farmland and fruit growing fields in the east, and the fishing loch of Loch Leven and nature reserve on the southern boundary. And thoughout the region the River Tay and its tributaries provide beauty and recreation. Glasgow and Edinburgh are both a one hour drive from the farm. Aberdeen and Inverness can be reached within 2 hours. Pets welcome by prior arrangement with additional cost of £5 per stay. Perth/A9 - Road: Newmill Farm is 5 miles North of Perth on the A9 Inverness Road. Do not turn off left to Stanley. Take the next turn off on the left to TULLYBELTON. Turn immediately left into the farm, come round the back off the cottage to the farmhouse where there will be some-one to meet you. The Smiddy Haugh Hotel offers comfortable accommodation in Aberuthven situated in the heart of Scotland. 4 bedrooms are en-suite,the 5th has it's own private shower room next door. Each has its own unique view of the village. Maintaining a traditional feel, the rooms are each furnished individually yet are fully equipped with today’s amenities: central heating, hospitality trays, TV and warm, comfortable beds! In the morning you'll enjoy a proper Scottish breakfast (or Continental if you prefer) in the dining room where you can plan the day’s events. In the evenings enjoy a home cooked meal in the restaurant, relax in the residents’ lounge or pop into the bar for a chat with the locals! Today the Smiddy Haugh Hotel is a family run hotel with a growing reputation for great hospitality combined with delicious cuisine, excellent service and a very distinctive ambience. You can be sure of a warm welcome whether you visit the hotel for the accommodation, a bar meal, dinner in the restaurant or just a drink in the bar. Chris, Ginnie are whole-heartedly committed to providing the kind of efficient, courteous service that will help make your visit to Smiddy Haugh an enjoyable and memorable experience. Every effort will be made to ensure that your visit is a happy one. The hotel is on Aberuthven's main street, 400 yards from the A9 and clearly sign-postedWe are roughly 10 miles south of Perth and 20 miles north of Stirling.The nearest town is Auchterarder 3 miles along the road, and just beyond it lies the world famous Gleneagles.Being close to the A9 dual carriageway, Aberuthven is convenient for Scotland's major cities, with Glasgow and Edinburgh Airport, both within one hour journey time. Welcome to the Cherrybank Inn The Cherrybank Inn is a family owned Perth Inn situated on the Glasgow Road. We have a very large car park for 40 cars so there is plenty of space if you would like to visit. The Inn has an excellent reputation for bar lunches and evening meals. If you would like to book a table please call us on 01738 624349. We have a Large range of drinks based on the best brands available. Choose from either our wide range of Cask Ales, Lagers, Ciders, wines or soft drinks. If you are a Connoisseur we are a keen supporter of REAL ALES and have 6 REAL ALES on Draught at all times. We are also listed in the Camra Good Beer Guide for the last years and were also voted Tayside CAMRA PUB OF THE YEAR RUNNER UP 2014. Our Range of over 100 Malt Whiskeys prove popular and we regularly receive visitors from all over the World. We also have All the Sky Sports & BT Sport HD channels for all the best of live sport We hold a Childrens Licence meaning the Inn can be truly enjoyed by all age groups. We specialise in golfing parties and we have discounted golf prices for a large range of golf courses in the Perthshire area. Whether it be Championship Courses or just a normal course we can get good discounts. Head north on M90 - Road: Head north on M90, At junction 10, exit toward M90, Keep left at the fork, follow signs for Stirling/Crianlarich/Inverness/A9 and merge onto M90, At Broxden Roundabout, take the 3rd exit onto A93, Go through 1 roundabout, Destination will be on the right. Head south on A9 - Road: Head south on A9, At Inveralmond Roundabout, take the 2nd exit and stay on A9 heading to Stirling/Glasgow/Crianlarich/A85/Edinburgh/Dundee/M90, At Broxden Roundabout, take the 1st exit onto A93 heading to Perth, Go through 1 roundabout, Destination will be on the right. We are a small family run hotel, which offers a warm, friendly and relaxed atmosphere. Sharon and Keith took over the establishment in March 2008 and since then have undertaken a refurbishment of the 6 en-suite bedrooms, bar and lounge areas. The pub offers a comfortable lounge area for relaxing and the main bar is a traditional village locals’ bar (come along and join in the banter!) with open fire for cosy nights to be enjoyed over the winter period. The bar area has two wide screen TVs with Sky Sports available and a very up to date digital juke box with every musical taste catered for. Both areas offer a wide selection of beers, spirits, malt whisky, wines and soft drinks. Guests can choose either Room Only or Bed & Breakfast. The Last Cast is located in the picturesque Bridge of Earn, it has easy access to the M90 motorway and sits 4 miles to the south of the city of Perth. Bridge of Earn village sits 4 miles to the south of the city of Perth and is an excellent location for visitors to the area to access several good golf courses for those keen on the sport. There are too many courses to mention but King James VI 18 hole course on an island in the river Tay is only 5 miles away with 27 holes over moorland and parkland. 10 miles away is the legendary Gleneagles with 4 courses and St Andrews – the home of golf – is only 25 miles from here. 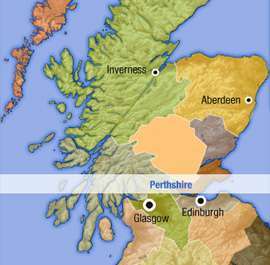 Kinross, Auchterarder, Drumoig, Carnoustie, Blairgowrie, Milnathort and Dunning are also nearby. None of the aforementioned golf courses are more than 30 miles away. Fishermen have an abundant choice for rod and reel. The Tay, the Tummel, Lyon, Garry, Ericht, Dochart and of course the Earn all boast famous beats providing excellent trout and salmon fishing. There are also a good number of fisheries in and around the area. There are a number of shooting estates in the area but shoots for deer, grouse and partridge need to be pre-arranged. Clay pigeon shooting is also available in the area. M90 - Road: Leave the M90 At junction 9, take the A912 exit to Bridge of Earn/?Newburgh, Turn left onto A912 Go through 1 roundabout, Destination will be on the right. The Scotia Bed and Breakfast is a friendly, family run guest house just 10mins walk away from the centre of Perth. Situated on the Dunkeld Road, Scotia B&B can offer reasonably priced, comfortable accommodation with off road car parking and secure parking for two wheeled vehicles. We serve a delicious hearty breakfast at a time to suit you, early starts are not a problem, or we can also offer you a room only option. We are child friendly and well behaved pooches are very welcome. Whether you are visiting Perth for pleasure or working in the area Alasdair and Suzie hope that you will stay with us at the Scotia B&B. The Dunallan Guest House is one of the finest establishments of its kind to be found anywhere in Scotland and is ideally situated within a few minutes walk from Perth City Centre. Dunallan Guest House offers quality 4 Star luxurious accommodation at very reasonable rates. Our emphasis is on our delicious breakfasts and friendly first class service in a comfortable and relaxing environment. Providing a high standard of friendly service ensures our guests have an unforgettable experience. Whether visiting Perth on business, leisure or tourism the Dunallan Guest House is an excellent choice and location. An ideal base for exploring the stunning scenery, castles, distilleries, lochs and glens or the many golf courses including Murrayshall, King James, Craigie and the famous Gleneagles and St Andrews. The idyllic and breathtaking surroundings makes Perthshire a haven for walking, cycling, fishing, golfing and active sports. Perth is the Gateway to the Highlands and was traditionally the home of Scottish Kings and Queens, many of whom were crowned at nearby Scone Palace. The City of Perth boasts the St John’s indoor shopping centre as well as all the usual High Street chains and you will also find many independent stores, specialist shops and boutiques and a wealth of cafes and eating places to suit any taste. In the evening, you can enjoy a quiet drink in one of the many bars and hotels, eat at one of the City's fine restaurants, or take in a show at the Perth Concert Hall or Theatre. Idyllically located on the banks of the River Tay in the heart of Perth, this family run hotel has been attracting guests from around the world for over 200 years. Notable visitors include Empress Eugenie and Queen Victoria who visited in 1848. The hotel offers 45 charmingly decorated bedrooms and feature rooms, all equipped with radio, television, telephone, trouser press and tea and coffee making facilities and free high speed broadband. Guests also benefit from complimentary access to our fitness suite and residents games room. Many of the rooms benefit from stunning views across the river and our award winning gardens. All of our bedrooms have ensuite bathrooms. Free limited parking is available on site. From the restaurant, the glorious views are as enjoyable as the Scottish cuisine, with a hand picked selection of traditional dishes readily available. A vast selection of world and local wines, fine beers including from Perth's Inveralmond Brewery and over 50 Scottish Malts and Premium Scottish Gin's are available in The MacGregor Lounge Bar. From The Sun Lounge, guests have another chance to take in the unspoilt views of Perth Bridge and Scotlands' longest river, The Tay. Located 100 yards from Perth Museum and Horsecross Concert and Conference Centre, and a 2 minute walk to the High Street. Highly popular venue with fishing and golfing parties, with St Andrews, Gleneagles and Carnoustie only a short drive away. Free Wifi throughout. Located on the banks of The River Tay, between The Queens Bridge and The Old Bridge. The car park is entered via George Street. Postcode for Sat-Nav: PH1 5LD. Parklands is boutique townhouse hotel situated in its own gardens with outside terraces. Ideal for business or pleasure the hotel is 5 minutes Perth's main shopping area, theatre, Concert Hall and the River Tay. Originally dating from 1880, the hotel was constucted as a home for the provost of Perth, the railway station and bus station are close by. The hotel has contemporary interiors. The hotel prides itself on the standard of it's food with two restaurants and a extensive selection of breakfast options are all combined with friendly efficient service.The hotel is child friendly with large family rooms. Parklands has been awarded 2 AA rosettes for dining. Free Wifi, LED Smart TV's , DAB Radio with Bluetooth and USB charging. Free parking. Tea and Coffee facilities in all rooms. Multi award winning hotel. Directions From Dundee (M90) Take Junction 1 off the M90 - signposted Perth A85. Follow Dundee Road into Perth. Turn Left at the first Set of lights, across the Queens Bridge. Turn left at the end of the bridge onto Tay street. At the mini roundabout turn right onto Marshall Place. Go straight on at traffic lights. The South Inch is on the left hand side. Parklands Hotel is the first building on the left after the park. Directions From Edinburgh (M90) Take Junction 10 off the M90 - signposted Perth & Inverness. Take the right hand fork off onto the A912 to Perth. Follow the Edinburgh road all the way, continuing straight ahead at the traffic lights at Tesco's supermarket. Continue to the end of the Edinburgh road, you will come to a set of traffic lights with The South Inch Park on your left hand side, take a left hand turn at the traffic lights onto Marshall place. Parklands Hotel is the 1st turning on the left. Directions from Glasgow (A9) Follow A9 to the Broxburn Roundabout on the outskirts of Perth. Take the 2nd turnoff, (A93) to Perth and follow the Glasgow Rd into Perth. At the first roundabout (Ford garage on left) go straight across and continue onto traffic lights at York place. (Grampian Hotel on left). Turn right into Caledonian Rd and follow road to end where there is a sharp left hand bend, continue on to T junction with the Bus Station facing you. Turn right onto Leonard St and follow road past the Railway Station and go under the railway bridge. Parklands Hotel is on the right hand side just before the park. Directions From Inverness (A9) Take the A9 to the Inveralmond roundabout on the outskirts of Perth and turn left onto the A921 (Dunkeld Rd. Continue straight past 2 roundabouts, go continue past the MacDonalds and the Safeway supermarket and then take the inside lane and go straight on at the next roundabout. Continue straight down road until you come to traffic lights beside a BP filling station and the Police station, take the righthand lane and turn onto Caledonian Rd. Follow this road straight ahead through another roundabout and onto traffic lights and continue onto the next set of traffice lights opposite an Iceland supermarket. Go straight ahead and follow road to end where there is a sharp left hand bend, continue on to T junction with the Bus Station facing you. Turn right onto Leonard St and follow road past the Railway Station and go under the railway bridge, Parklands Hotel is on the right hand side just before the park. Situated within its own 1500 acre estate, Ballathie Country House Hotel has the enviable stunning location on the banks of the River Tay, only a few miles from the City of Perth, gateway to the Scottish Highlands. Set in Kinclaven, Stanley, just 19 km from Perth city centre, which is home to a theatre, concert hall and specialist shops, Ballathie House is 11 miles from the city centre and 21 miles from Dundee. The hotel has 41 bedrooms with classic rooms in the main house enjoying views overlooking the river or surrounding countryside and each one being individually decorated, offering comfort and all amenities expected of a luxury country house. All have en suite bathrooms, TV, free Wi-Fi, and tea and coffee making facilities. Also located in the main house are the master bedrooms which are spacious with modern touches having been sensitively introduced to blend well with the period features. Master bedrooms are subject to availability on request with a room supplement applicable. The Riverside Hotel rooms lie a mere 100 yards from the main house, linked by a lit pathway through the garden. Each bedroom is incredibly restful with its own patio or balcony with spectacular views over the River Tay. All riverside rooms have the same luxurious finish as the rooms in the main hotel. Suites are subject to availability on request with a room supplement applicable. Sportsman’s lodges are a short stroll, (80 yards), from the main house. Each room is self contained with its own private access and private facilities, offering good quality alternative three star accommodation. Breakfast is served in the main hotel. Over the years at Ballathie, we have built an envious reputation for our food. A past winner of Rural Restaurant of the Year, we don't like to make too much of a meal of it, but we are quietly proud of our consistently achieved 2 AA rosettes. Both the lunch and dinner menus are seasonal to bring the best of the market or catch of the day straight to your plate. Our bar has a large selection of quality wines, with over a dozen to choose from available by the glass. Take the A9 dual-carraigeway North from Perth. Two miles North of Perth take the B9099. Follow the road through Luncarty and Stanley. After Stanley, take a right turn at the sign for Kinclaven and Blairgowrie. Ballathie is a further 3 miles along this lovely road and clearly signposted. Set within 350 acres of private estate, 3 miles from the city of Perth, this 4 star luxurious hotel provides fabulous accommodation in a spectacular setting. Renowned as one of Scotland's leading Country House Hotels, Murrayshall offers a choice of dining, - the award winning Old Masters Restaurant, where seasonal menus feature locally sourced ingredients, or alternatively the Club Restaurant, where food is available all day in a relaxed environment. Most of the bedrooms and suites have views overlooking the gardens or the surrounding Golf Courses. Murrayshall is home to two 18 hole Golf Courses - the championship Murrayshall, a par 73 Parkland course, and the slightly shorter Lynedoch, par 69. From M90 follow A93 for Perth for approximately 2 miles. Turn left and follow inner ring road. Hotel is on right adjacent to Perth Train Station. Reputed to be the oldest hotel in Scotland, and a regular award winner, this city centre hotel has 84 en-suite bedrooms and is only minutes’ walk from all the shops, theatres, Concert Hall and the beautiful walks round the River Tay. All rooms, Classic and Superior, offer tea/coffee making facilities, hairdryer and toiletries and there is a wide selection of family rooms as well as two Four-Poster rooms. Take dinner in our Adam Restaurant or Bar Supper in Reid’s Bar where excellent local produce is served by our friendly, helpful staff. There are 34 different choices on our Breakfast Menu including our Healthy Living range and traditional Full Scottish Breakfast. In Reid’s Bar where a large selection of malt whiskies and gins can be found, lunches and suppers are served daily. The hotel is only 45 minutes’ drive away from Edinburgh and boasts some of the largest hotel conference space in Perth. Leave M90, A9, M85 when Perth is indicated and proceed into city centre towards River Tay - we are 20 meters from the Queens Bridge.